Starting with one pair, pull the strand on the right over the left strand and hold with left hand. Turn tube slightly. Working the next set, pull the strand on the right over its partner as before, then under the left strand of the previous set. (See photo #2). 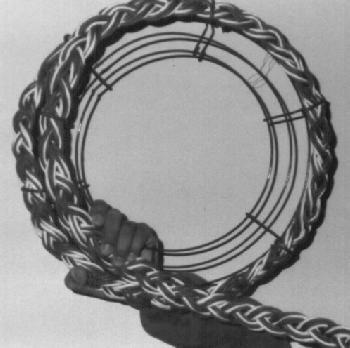 Continue in the same manner around the tube with the remaining three groups, working one group at a time, with each right handed strand being woven over then under then over, etc. the left hand strands. You will have the 5 left handed strands going right and the other 5 going to the left. (See photo #3). Continue turning the tube and weaving the strands all the way down the tube until you reach near the bottom of the tube. 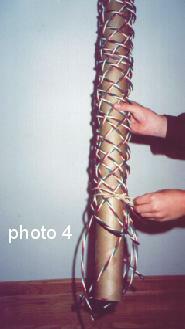 Using the string, tie a bow around the bottom of the tube to keep weavers together. (See photo #4). Remove the tape from the top of the tube. While holding the top strands together, slide wreath off tube a few inches, then secure ends with string. Slide wreath completely off tube and tighten string around bottom of wreath. Cut any uneven strands so 5″ are left. 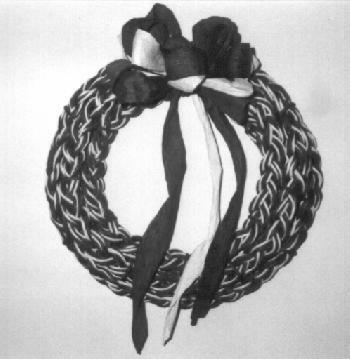 Form a circle meeting where ends of weaving stop so unwoven pieces extend on both sides of wreath. Secure with string or wire. 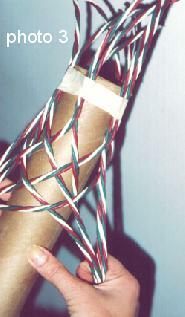 Untwist several strands of the triple on each side leaving 1″ at very end twisted. (See finished photo). Untwist paper and cut into pieces 8″ long. Loop each in half and glue to wreath mixing colors of loops. See finished photo for placement. Cut a piece of Triplex 1 1/2 yards long. This will be used to make your bow toward completion of the project. Cut the remaining Triplex into 6 equal pieces 3 1/2 yards each. Using floral wire, wire these 6 pieces together as close to one end as possible. Divide the Triplex into 3 groups – 2 strands per group. Beginning at the wired end, braid the 3 groups together all the way down. NOTE: Each time you braid a group of strands, pull them away from the rest to prevent tangling. When you reach the end, wire all pieces together with floral wire. Attach the braid to wreath. Start with outside row of box wreath. Tuck end of braid between wires on wreath and wire the braid to the wreath with a piece of soft paper covered wire. 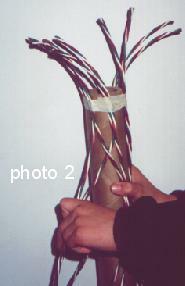 Cut remaining soft paper covered wire into pieces 4″ long. Lay braid onto wreath and wire (with your soft paper covered wire) every 6″, Continue this all the way around wreath creating 3 continuous rows. When you finish all three rows, tuck the end in between wired of the wreath. Using the 1 1/2 yards of Triplex, separate the three strands, then untwist each one. 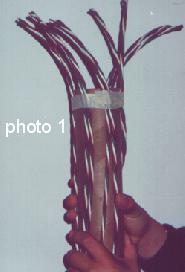 Holding the three strands together, leave a 12″ tail and form about a 4″ loop on each side. Do this twice, then form a very small loop in the center. Using floral wire, string the wire through the center loop and around the bow. Twist wire tightly in back of bow. Wire bow to the wreath.